Collins Booksellers - What Hurts the Physician Hurts the Patient: MedRAP by Iris Mushin, 9781944952181. Buy this book online. 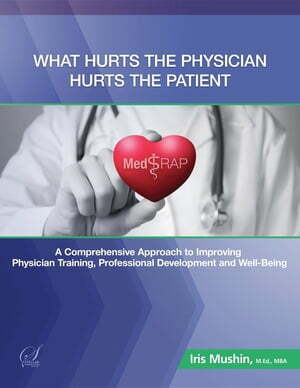 What Hurts the Physician Hurts the Patient describes MedRAP, a comprehensive program designed to advance the professional growth of medical trainees and improve their well-being by addressing factors that lead to stress and burnout. The program focuses on facilitating the transition into the medical training environment and improving the organizational culture. The program also focuses on addressing ACGME competencies such as communication and interpersonal skills, professionalism, and systems-based practice skills. The Quality Improvement (QI) component of the program involves the entire health care team to facilitate collaboration and improve the efficiency of the hospital work environment and patient care. Because of MedRAP’s efficient design, maximum benefits for medical training programs can be achieved with a judicious commitment of time and resources. For more information, visit www.medrap.org.